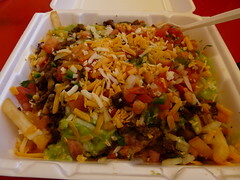 Last night, FriendFeed user Live4Soccer posted a photo of carne asada fries. After wiping the drool from my face, I realized that I hadn’t had carne asada fries in probably 7 years. Today, I had a goal to rectify that problem. For lunch today, we hopped in the car and drive over to Chano’s in Lincoln Heights. Now, I’m not generally impressed by Chano’s food overall, but they’re close to us. I ordered my carne asada fries with no substitutions just to see what came on it. It was carne asada, guacamole, refried beans, tomatoes and grated cheese. I’m used to having it with pico de gallo, lettuce, sour cream and no beans. Since I was starving, I dug in eagerly. Very tasty, despite the beans, but defintely needed more spice, lettuce and sour cream. I got the last two items on the side and mama was happy, though I could have also used more cheese. The order was $6.75, but I could only eat about half of it before I was stuffed. Now my mission is to remember which place in Echo Park had it with the crinkle fries because that was memorable. Thanks, Evan. I did see that, but as a resident of Northeast LA, I’m going to stick to my side of town. If I ever have to do some work over there, I’m definitely going to try them out. On your side of town, also try My Taco at 6300 York in Highland Park, east of Figueroa just before it comes Pasadena Avenue, in a shopping center. Yes, please! I’d like mine with extra cheese. Next PostNext L.A. Geek Dinner Celebrates 3rd Anniversary Tonight!